Visage 7 shatters all pre-conceived notions as to what’s possible in a single, enterprise viewer. 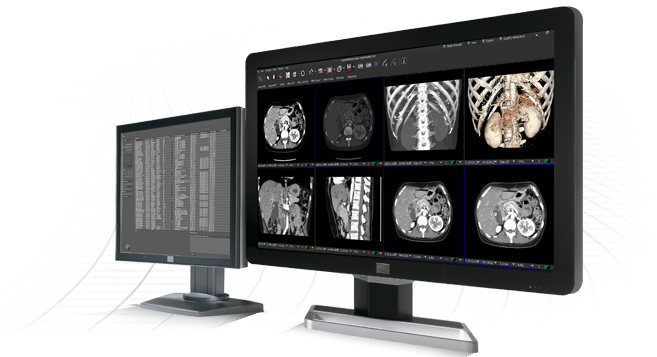 Visage 7 delivers user-customizable, multi-display, multi-dimensional, protocol-driven interpretation and referring physician access to all diagnostic imaging modalities, and non-DICOM too. 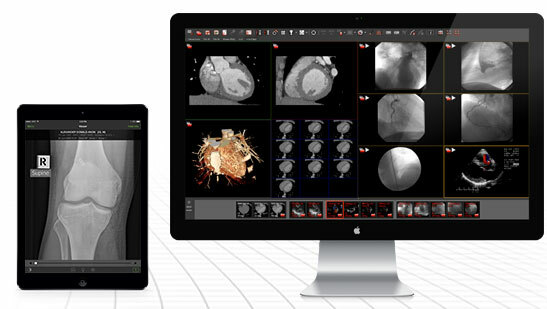 Visage 7 allows radiologists and referring physicians to do more, enabling interpretation of multi-modality breast imaging studies and PET/CT lesion tracking, as well as native advanced visualization modules for neurology (brain perfusion), oncology, cardiology (cardiac CTA) and vessel analysis. Visage 7 provides a more natural radiologist reading workflow, delivering protocol-driven, server-side rendered 2D views, as well as MIP/MPR/Volume Rendering and advanced visualization, on a single desktop, including on-the-fly reconstructions of coronal and sagittal views from the original axial slices. And because Visage 7 offers a powerful viewer for all users, referring physicians benefit from a customized experience that is matched to their level of sophistication. One ultrafast, multi-dimensional viewer, for all diagnostic modalities (CR/DR, US, AWBUS, NM, CT, MR, PET/CT, PET/MR, FFDM, DBT, Dexa, XA, Cardiac Echo, Cardiac Cath). Non-DICOM images are also supported, including the following file types: *.bmp, *.jpg, *.tiff, *.pdf, and MPEG 4 HD videos. Visage 7 offers the following native functionality for advanced visualization: core multi-planar reconstruction, volume rendering, on-the-fly; core multi-modality display (i.e. multi-modality breast imaging MG, DBT, AWBUS, Breast US, Breast MR); PET/CT Lesion Tracking; Cardiac CTA – Calcium Scoring, Functional Analysis, Coronary Artery Analysis; CTA/MRA Vessel Analysis; TAVR workflow; Brain Perfusion; dual echo, simultaneous display of EKG (stress/rest); automatic multi-modality registration; diffusion curves for breast and prostate imaging. Server-side pre-processing of multi-slice studies delivers incredible speed and on-the-fly reconstruction from axial images, all at the fingertips of the reading radiologist and authorized referring physician. Because reconstructions are delivered on-the-fly, this eliminates the delay of waiting for technologists to perform secondary captures at the operator console. Visage 7 supports a practically unlimited number of user levels to offer customized, sophisticated access for advanced referring physicians (e.g, orthopedic surgeons, oncologists, cardiologists), as well as simple, intuitive access for general practitioners. Visage 7 offers Save Sessions to share and collaborate studies at the exact desired study presentation state, with radiologists and referring physicians. Auto-prior rules are easily configured using Boolean logic, GUI-driven tools. And even if a prior is not displayed automatically, there is no time penalty to display an additional prior. Visage 7 supports the attachment and display of non-DICOM images and voice memos as additional series to existing Visage 7 studies. Visage 7 is a single code base, and does not use external or third party code for advanced capabilities.